The following is a list of the major league baseball players who have won the World Series the most number of times. This is a great list for New York Yankees fans like myself, because every player on the list won at least one World Series playing for the Yankees. In regards to that, it was easier for the Yankees to win the World Series in earlier times because there were many fewer teams in earlier times than there are today in the major leagues. Players are listed if they played for a team during the season that the team won the World Series. With 10 World Series Championships, Yogi Berra is the all-time leader in baseball history. 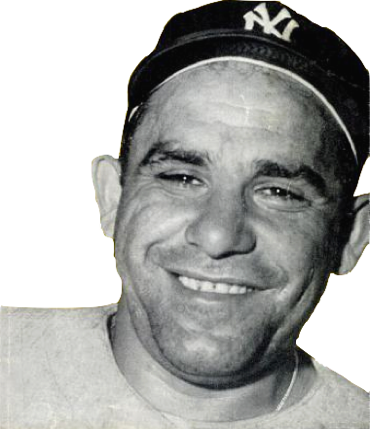 Yogi won the World Series with the New York Yankees in 1947, 1949-1953, 1956, 1958, 1961, and 1962. Yogi Berra played in the majors for 19 years, so he won the World Series in over half the years he played in. Joe DiMaggio played in the major leagues for 13 years, all with the New York Yankees, and won the World Series in nine of those years. Joltin' Joe won the World Series in 1936-1939, 1941, 1947, 1949-1951. Joe DiMaggio would probably have won even more World Series, but he missed the 1943 to 1945 seasons due to WW II. Bill Dickey won eight World Series Championships with the New York Yankees in 1928, 1932, 1936-1939, 1941, and 1943. Dickey spanned the Babe Ruth era to the Joe DiMaggio era. Phil Rizzuto won eight World Series Championships with the Yankees in 1941, 1947, 1949-1953, and 1956. Like Joe DiMaggio, Phil Rizzuto would probably have won even more World Series but he too served in the military during WW II and missed the 1943 to 1945 seasons. Frank Crosetti won the World Series in 1932, 1936-1939, 1941, 1943, and 1947 with the Yankees. Lou Gehrig won eight World Series Championships with the New York Yankees in 1923, 1927, 1928, 1932, 1936-1939. Babe Ruth won seven World Series Championships in his 22 year major league career. The Babe won three World Series Championships as primarily a pitcher with the Boston Red Sox in 1915, 1916, and 1918. He then won four World Series with the Yankees as a hitter in 1923, 1927, 1928, and 1932. Babe Ruth did actually pitch in five games with the Yankees. He started four games and relieved in another one, and, even though he pitched to a 5.52 ERA, he won all five games. Mickey Mantle won seven World Series with the New York Yankees in 1951-1953, 1956, 1958, 1961, and 1962. Pitcher Johnny Murphy won seven World Series with the Yankees in 1932, 1936-1939, 1941, and 1943. Pitcher Herb Pennock won seven World Series Championships in his career. Pennock won the World Series in 1913 with the Philadelphia A's, in 1915 and 1916 with Babe Ruth and the Red Sox, and in 1923, 1927, 1928, and 1932 with the New York Yankees. OF Tommy Henrich won seven World Series in 1937-1939, 1941, 1947, 1949, and 1950 with the Yankees. OF Hank Bauer won seven World Series with the Yankees in 1949-1953, 1956, and 1958. Believe it or not, Hank Bauer led the American League in triples in 1957 with nine. Bauer actually hit 57 triples in 14 years in the majors.